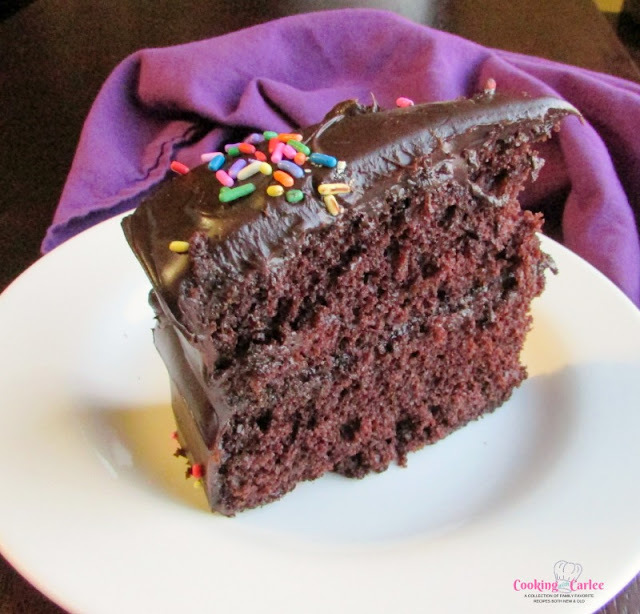 This is THE PERFECT chocolate cake! 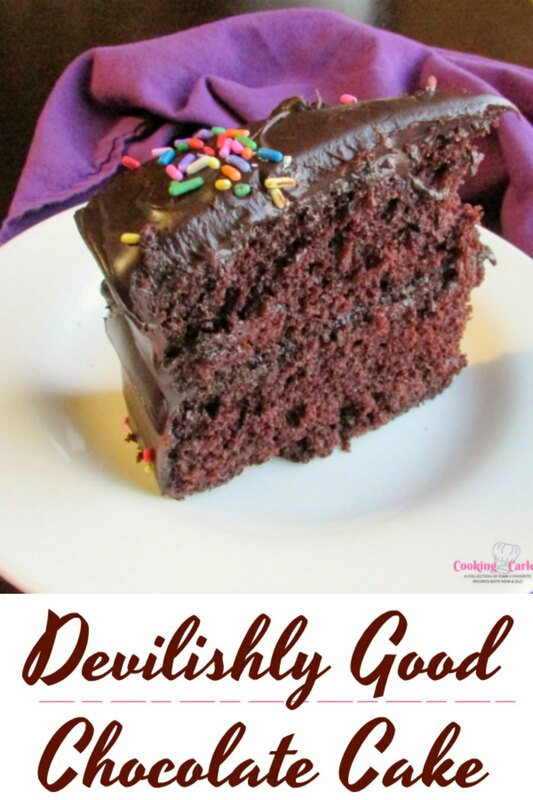 It's easy to make, the texture is soft, and it's devilishly good. Do yourself a favor and make it ASAP! This is my go to chocolate cake! I use it as the base almost every time I need chocolate cake. It is so easy to make. You can do it with a mixing bowl and whisk, no fancy equipment or ingredients required! It is sure to win you over as well! For Little Dudes's second birthday, I wanted to make him delicious cakes. Something that went a little beyond the cake mix and tub of frosting. Not that there is anything wrong with that, I readily eat it when placed in front of me! But I just knew this old fashioned chocolate cake would be a great option. No fancy frills. 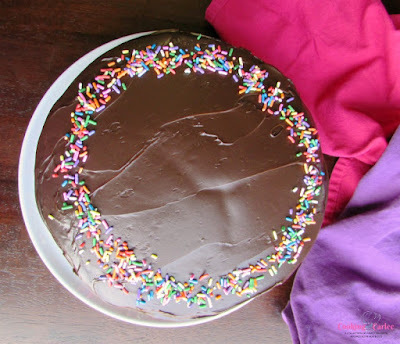 It is just a classic cake with dark chocolate flavor covered in a fudgy frosting. What's not to love about that? It was such a hit, I couldn't help but to make it again. It is a rich, moist cake that begs for you to get every last crumb. 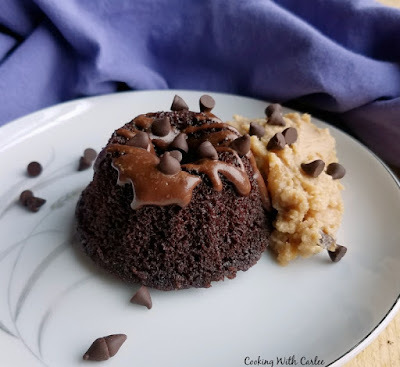 I love this cake recipe so much that I have gone back to it every time I have needed a chocolate cake for another application. In fact, I made a treasure chest cake out of it for little man's third birthday and I used it for a Ding Dong Cake as well. It is so easy to put together. There is no mixer needed, nothing fancy to do. Just ingredients that I always have in my pantry. In less than an hour, with no softening of any ingredients you have a cake! I have made this cake dozens of times since I originally posted it, but never had a chance to update the pictures. Mostly because the cake was being used in almost unrecognizable ways. So I really wanted to make it as a classic layer cake again. Because as versatile as this cake is, it really goes so well with this shiny fudge frosting and you can't go wrong!! If you aren't in the mood for fudge frosting, never fear! There are so many great options. 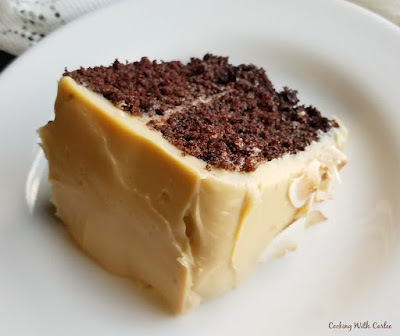 We really loved the creamy caramel sweetened condensed milk frosting on it as well! This recipe doesn't always have to be made as a layer cake either. 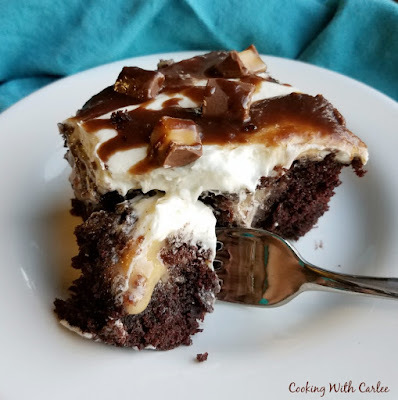 It bakes great in a 9x13 and is an excellent base for something like a rolo poke cake! The caramel makes delicious pockets of goodness in the cake and a nice fluffy ermine frosting coats it all! I've also baked it up into mini bundt cakes and served it with peanut butter whipped cream. So as you can see, this recipe is super versatile. Pretty much anything you need a chocolate cake recipe for, this beauty can fill in. Plus you are likely to have most of the ingredients on hand already! This recipe is super versatile, use it for a 9" layer cake, bake it in a 9x13" pan or even make cupcakes or mini bundts out of it. One of my favorite parts about this recipe is there are no ingredients that need to come to room temperature. You can whip up a cake whenever you feel like it. You don't need any fancy equipment for the cake, just a bowl and whisk will do. Just make sure to get all of the flour incorporated without over mixing it. That's the key for a tender cake. Have fun with it! This cake is a perfect starter cake if you want to get into making homemade cakes. It is also a great easy recipe for seasoned bakers. There is a reason it gets rave reviews from everyone who makes it. Do yourself a favor and give it a go! This is my go to chocolate cake recipes. It is moist, delicious and oh so easy to make! I have used it as the base for so many different recipes because it is quick and delicious! Preheat oven to 350F and grease two 9 inch round cake pans or a 9x13" pan. For a layer cake: Divide batter between the two pans and bake until a toothpick inserted in the middle comes out clean, about 40 minutes. Cool cakes for about 15 minutes and then invert onto a baking rack to cool the rest of the way. For a 9x13: pour the batter into the prepared pan and bake for about 50 minutes, or until a toothpick tests clean. Once completely cooled, frost the cake. We will always like the shiny fudge frosting, but also love this cake with cream cheese frosting and whipped cream frosting. This cake sounds and looks amazing, YUM. Will make a copy and thanks for sharing. The addition of adding the vinegar is interesting. It really is good! You need a little vinegar to activate the baking soda. I hope you love it! That does look sinfully delicious!! It is worth every discretion! Hello! That chocolate cake looks scrumptious! Thanks for sharing the recipe. Pinning! Thank you! It is pretty darn tasty! That cake! Oh my! It looks so rich and moist. I'm definitely going to bookmark this for future reference. Thank you for visiting #AnythingGoes. Thank you for stopping by. I hope you make it and love it! That looks delicious! Thanks for sharing with the #BlogFair. Thanks for hosting. We REALLY enjoyed this cake! Oooooo goodness this looks really yummy! Thanks for sharing on The Oh My Heartsie Girls WW this week!! Thank you, it definitely won us over! Currently sugar free till July 1 my birthday...this will be my cake. Can't wait. I hope you love it!! I need to go sugar free until July 1, we have really been overdoing it lately. Looks like the perfect chocolate cake!! Thank you so much for linking up at Tasty Tuesday! Your recipe has been pinned to the Tasty Tuesday Pinterest board! Please join us again this week! We really enjoyed it. Thank you! Sounds delicious! I love a good chocolate cake recipe! Thanks for sharing at Tips & Tricks! This is a really tasty one and comes together easily. It is worth a try! Oh yum! I bet your little guy was so happy with his cake (and frosting)! Thank you for sharing at the Talented Tuesday Link Party! The coffee really does add some depth to the chocolate without making it taste like coffee. Thanks for stopping by! You have my sweet tooth aching!! Lol!! Thanks for Sharing on My 2 Favorite Things on Thursday - Link Party!! Hope to see you again tomorrow!! Pinned!! Thank you! After hosting the mother's day dessert buffet, Jaxon's birthday and then my mother-in-law's wedding three weekends in a row, I need to detox from sugar! But, I'm sure in a day or two I'll be ready to make something new! You have just made me so hungry for a great slice of that cake! Thanks so much for sharing your post with Full Plate Thursday. Hope you are having a great day and come back soon! It was really good! I am glad most of it disappeared during the party, it would have been very dangerous for me if I knew there were leftovers hanging around! Thanks so much for hosting and for stopping by! Nothing beats a good chocolate cake...expect for a peanut butter cake! Thanks for linking up and sharing your recipe with us at Funtastic Friday. I hope you join us again this week. Oh my, having both around made it really hard to choose!! Thanks for stopping by, I'm sure I'll be seeing you Friday! Nothing wrong with the classic chocolate cake. Thanks for sharing at #Throwback Thursday. Please join us again and remember this week will focus on Thanksgiving recipes. I'll have to break out some of my favorites! Thanks for hosting! Yum!!! now I seriously want to go play in the kitchen. Thanks for linking up with From The Archives Friday! You should! It is a great day for baking! Give me chocolate every single time!! Looks delish, Carlee! Me too! One of our friends just made this cake for her niece's birthday and was showing me pictures, now I want to make it again! Thanks, Mollie! Yay and perfect for Fat Tuesday!!! Chocolate at it's best!! My heart started palpitating faster as I read your delectable description of this decadent cake. It sounds devilish, indeed. Love the way you added the little sprinkles. Thanks for sharing with us on The Blended Blog. Thanks so much for stopping by. I hope you have a good excuse to make one of these soon! Oh man, you should move closer to us! We could start a food exchange program.. maybe just take turns cooking? Hi Carlee, my most favourite cake is a nice, rich chocolate cake. This is one I am going to have to try, that's for sure. I do always add a sprinkle of coffee granules to anything chocolate I make, but have never added vinegar to a cake. I really can't wait to make it. It's my song birthday this weekend, but he has requested coconut cake.... Maybe he wouldn't notice! He'd be dazzled by all of the chocolate and not know, for sure! Or maybe you could serve it on a bed of coconut instead?! ;-) The vinegar helps it rise since it uses baking soda instead of baking powder. It seems like a strange ingredient, but I promise it works! The coffee really adds something to chocolate treats, doesn't it? Have a great weekend, Debbie! Ah!! I can't wait to hear how it went over! It went down a treat and as it was so rich we actually still have some left! It is a cake I will be making again, that's for sure. YUM! I am turning my screen away from my husband so he doesn't see this one! I don't have any cocoa on hand, and if he see's this one he will have me running to town so I can bake it! You had better put it on the list! This is a well named cake. It must be sinful! It is, in the best sort of way! Thanks! Your chocolate cake looks delicious, Carlee. You can never have too many chocolate cake recipes! Thanks for sharing at Snickerdoodle. Pinning. You can never have too many! And you have to try as many as possible in the name of science. It's rough! Homemade chocolate cake-looks delish! Thanks for sharing on Funtastic Friday! I'm such a sucker for a chocolate cake and nothing beats one that's homemade with a hint of coffee. This one would last all of 10 minutes in our house Carlee. All right. I'm calling dibs on a piece next time you bake this! I supposed you can have one too! Sure thing, Betty! It is here: http://www.cookingwithcarlee.com/2015/05/shiny-fudge-frosting.html or there are a couple of links for it in this cake post if that is easier! I hope you love it! Chocolate cake is my fav! I always liked butter cake with chocolate frosting the best, until I stumbled upon this chocolate cake! This cake looks amazing! So moist! 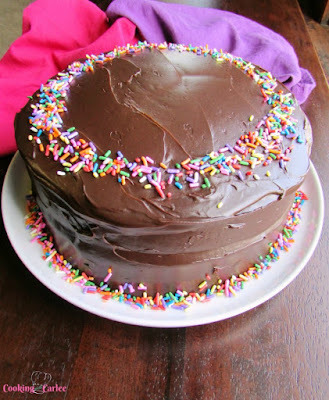 The sprinkles add just the right amount of color. Thank you! It is a favorite of ours for sure. I love how good it taste and how easy it is to make! That's what worked for me. Ovens do vary and so do recipes, you are welcome to start checking it earlier if you'd like. How can this not be wonderful! So rich and chocolaty! Thanks for sharing at Celebrate365 chocolate party.